The past week has been such an incredible experience. Keri and Leo are about the nicest and funniest people you will meet. My stay there with the very talented TG Goh was more than I could ever ask for. I personally felt that they helped made the whole experience of visiting Geneva and Zermatt so much more meaningful. They say that when you watch a good movie, you inevitably think about the movie long after it has finish. It’s quite the same here. Although I am now in Paris, I keep thinking back about the wonderful time spent in Switzerland. Here is a preview of sorts. It’s a small collection of images taken during our shoot. Geneva’s a small town (population-wise…cos coming from a Singaporean, calling anywhere else a small town just has no credibility. Ha) The people here are pretty friendly and we met a few really nice personalities during the shoot. 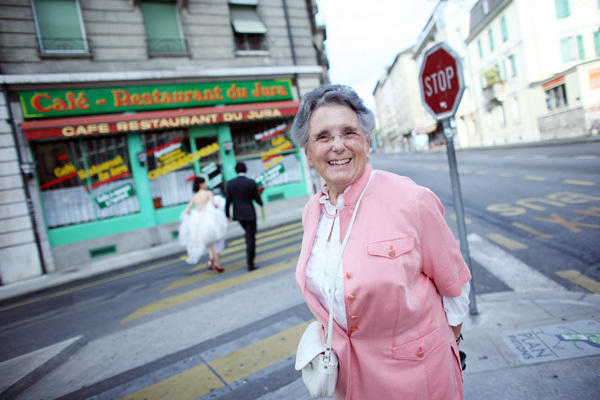 A friendly old lady who was quite amused that there is a wedding couple at 7am in the morning on the streets of Geneva! The lady who did Keri’s nails… she was really pleased to see Keri in her gown! Little baby Angela. She’s such a sweetie. She never stops smiling! Her mom Ruxanne explains that she told Angela when she was born that there was nothing to be sad about and she should be happy. The child is now all smiling. =) Little kids abroad always remind me of my own two girls, Kyra and Nessya. More images from the actual shoot to come in the next few days. ~ by Kelvin on August 17, 2009.